Arpwood Capital (which advised the $760 million investment by Temasek in the $2.1 Billion Schneider Electric buyout of L&;T Electrical and Automation business) and Avendus (which advised the $210 investment led by DST Global and Naspers in Swiggy) completed the Top 5 list by value. 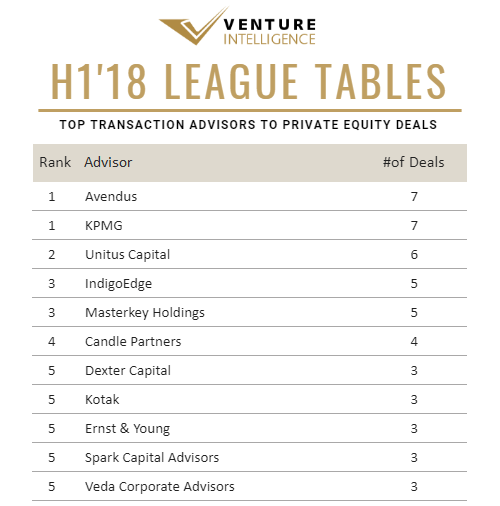 Avendus and KPMG (7 deals) topped in terms of volume of PE deals advised, while Unitus Capital claimed the second spot advising 6 deals. IndigoEdge and Masterkey Holdings came in at third position advising 5 deals each. 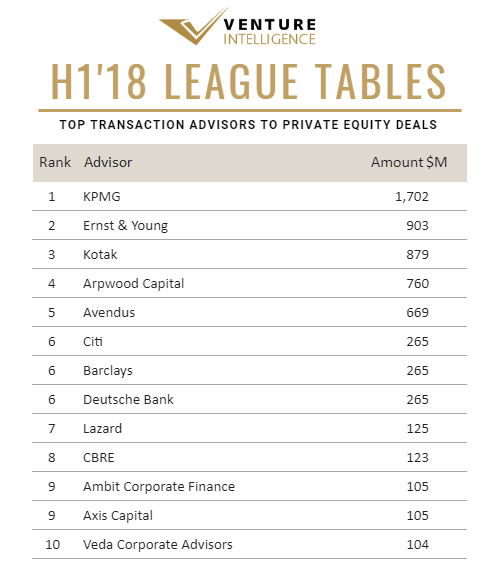 Inclusive of its roles in due diligence and related advisory activities, KPMG also topped the tables advising deals with a value tag of $2.7 Billion (across a total of 21 qualifying deals) during H1'18. EY came in at second spot advising deals worth $1.9 Billion. 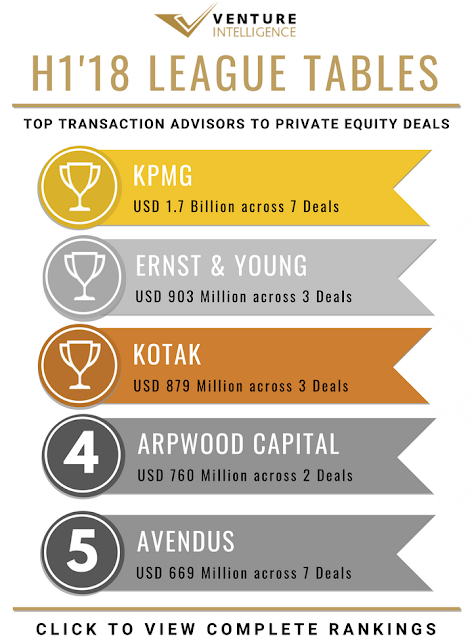 Within IT & ITeS, Avendus topped by volume and value advising 5 deals worth $575 million. By deal volume, IndigoEdge (4 deals) came in at second followed by Masterkey Holdings, Dexter Capital and Candle Partners with 3 deals each. In Financial Services, Ambit Corporate Finance topped the table, advising the $105 million investment by Warburg Pincus in IndiaFirst Life Insurance. By deal volume, Unitus Capital topped with 7 deals worth $64 million followed by Avendus and Intellecap with 2 deals each.